Healing Neck Alignment - Touch examination before gentle massage then deep tissue work leading to adjustments to get your neck in perfect alignment. Shoulder Relief - Special adjustments combined with precise pressure point release opens above your shoulders and in-between. Upper Back Pain - Target parts of the upper back to alleviate deep pain. Low Back Yoga Adjustment - The low back is checked for alignment, muscle imbalance, and possible disc injury then carefully treated to align energize and revitalize. Shakti Hip Opener - Open your hips with deep tissue palpitations around your sacrum, the top of the hamstrings, and inner thigh to completely free up the hip movement like never before. Earth Foot - Ground your energy by unblocking tension with this special foot massage that deeply works into the soul or your sole. Intro Consultation and 60 minute adjustment. Each session 60 minutes includes healing reports based on initial assessment. Get quick fixes with 30 minutes dedicated to the neck and shoulder muscles. 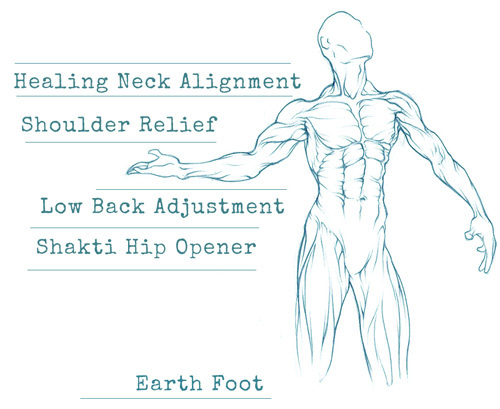 Keep your neck in alignment and remove tension from deep tissue with these quick sessions. Mark Giubarelli has helped thousands of people with neck pain. He is a master at removing muscle pain and aligning the bones. Get special adjustments in Yoga poses to help align your spine. Learn poses that keep it straight and ones to stretch it.